Astrophotographer John Chumack captured this amazing view of the full moon on July 31, 2015 from Dayton, Ohio. The November full moon rises tonight (Nov. 25). November's full moon will rise tonight, bringing an early Thanksgiving treat for skywatchers lucky enough to have clear skies over the long U.S. holiday weekend. 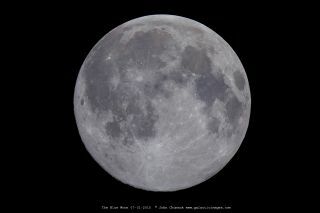 The full moon tonight (Nov. 25) moon will be at its best tonight at 5:44 p.m. EST (2244 GMT), but to the average skywatcher, the moon can appear full in the day before and the day after the actual event. That means that the moon may still appear full on Thanksgiving as many U.S. skywatchers get full on turkey dinners to celebrate the holiday. November's full moon is traditionally known among Native Americans as the Full Beaver Moon. "Another interpretation suggests that the name Beaver Full Moon comes from the fact that the beavers are now active in their preparation for winter," Rao explained in his guide to the full moon names of 2015. November's full moon is also known as the Frost Moon or the Frosty Moon, according to Rao and the "Farmer's Almanac," which is no surprise, since it comes at a time when the days take on a prewinter chill in the North. And if tonight's full moon isn't enough of a holiday treat for you, just wait until next month. The full moon of December will occur early on Dec. 25, making it a dazzling lunar present for Christmas morning skywatchers. Editor's note: If you capture an amazing view of the full moon tonight or any other view of the night sky, and you'd like to share it with Space.com and its news partners for a possible story or gallery, you can send images and comments to managing editor Tariq Malik at spacephotos@space.com.